Does your favourite cook book include household hints? Cookbooks in the late 19th century often included non-edible recipes. 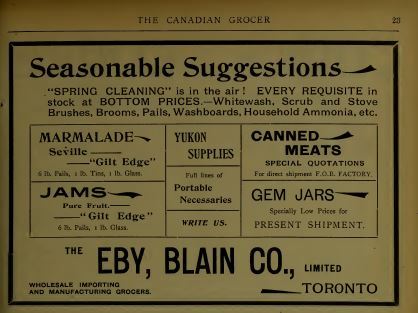 I thought it might be interesting to check out some of the recipes in the Useful Hints section of The New Galt Cook Book (1898) — at least the ones that appear safe. The one I tried is To Clean a Hair Brush which sounds very much like the way we cleaned brushes when I was a child. It was my job, usually on Saturday night to clean the brushes. 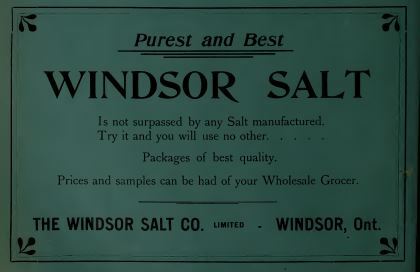 One of many ads for salt in The Canadian Grocer magazine in 1898. I’m also including the recipe called Uses for Salt since the first paragraph clearly describes a method I tried years ago to keep some black jeans dark. I added salt to the water in my washing machine and let the clothes soak in it before continuing to wash them as usual. Perhaps the instructions for cleaning straw matting or willow furniture with salt water will be handy for some of you as you prepare for summer. I suspect few of you need to know how to mend a crack in a stove, certainly not a wood fired cook stove, but if you do try combining salt and wood ashes with water and plaster of paris to fix it let me know! I grabbed a hair brush from my dresser and dipped it in a container of water with some baking soda in it. This is a step I don’t remember from childhood. Next I prepared the ammonia mixture. I put some warm water in a container and added about a teaspoon of ammonia. It was a familiar smell but not very pleasant. Somehow the smell of bleach is more acceptable than the smell of ammonia. However, I think the ammonia is used to sterilize the brush and to cut grease that will have collected on the brush. At least in the 1890s grease would collect since the brush was used to distribute the natural oils throughout a woman’s hair rather than the frequent washing so many of consider necessary. I swished the brush around in it just as I did as a kid. Growing up we put the brushes on a towel but I tried it with brown paper as described in the recipe. I couldn’t put it on the back of a cook stove and it is too warm out to use my radiators so I just left them to dry with the bristles down. This method f0r cleaning hair brushes worked just like it did when I was a child. To clean hair brushes, dip the up and down in soda water, rinse in tepid water in which a little ammonia has been mixed. Place several thicknesses f brown paper on the back of a very moderate oven, set the brushes upon this, bristles down, and dry. When washing black articles, salt in the water tends to set the colors and prevent them from running. Salt and water will thoroughly clean straw matting or willow furniture that has not been stained or colored. Apply it with a small brush of any kind. A crack in a stove may be mended by applying a mixture of salt and sifted wood ashes in equal parts, moistened with water. A little plaster of paris adds to the durability of the preparation.